Bioclipse 2.0 introduced a new, powerful molecular table support, and we have been eager to test that on large SD files. A recent ChEBI SD file failed to open, and eyes were immediately at the CDK, which is the cheminformatics library used in Bioclipse. After careful investigations, it turned out that the ChEBI file contained a few entries which were not MDL molfiles, but queries for the ISISBase system. Those cannot be read by the CDK MDLV2000Reader. However, it crashed on it, instead of failing more savely. That's not nice, and fixed. But, the problem is rather recurrent, and the reason why I like CML so much: invalid input. CML, based on XML, has several general validation approaches that give in-depth error messages of what is wrong with the file. So, I asked on the BOx what the Open Source cheminformatics community had to offer for this. Turns out that several tools find problems in the files, but none could report where the error occurred. Now, some time ago, I played with two reading modes, RELAXED and STRICT, as faulty files is core cheminformatics material, and the software is blamed if the QSAR model resulting from it is not good (seriously). Anyways, a small API change in the CDK would make a validating MDLV2000Reader quite a step closer, but I had not followed up on it until last Friday where I patch I was reviewing caused 6 new unit test fails. The new fails were caused by a assumption which turned out the be false in the test files used in those 6 unit tests. but does not specify which fields are optional. And indeed, many tools around save MDL molfiles with one or more fields missing, leading to shorter than expected line lengths. And, as you might have expected, the failing unit tests had files with lines missing the field introduced by the patch, causing Exceptions being thrown around. 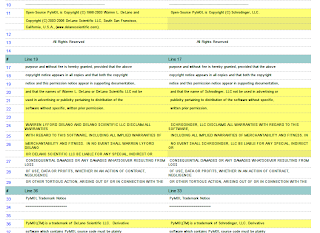 I have yet to make up my mind of the lack of those fields is a problem in the file, or allowed by the format. In either case, the information from that field is not available, and the reader could safely ignore the missing information. Per user demand. So, I am hacking up a patch for CDK master to allow error reporting by IChemObjectReaders. 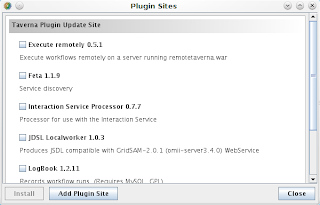 The initial version of the API update and use in the MDLV2000Reader are available as Gist 290659. They are not final yet, as I realized when making the above screenshot, that merely int col is not enough, and that I actually need the startCol and endCol positions instead. Also, there are only an error level at this moment, and no warning level as in the screenshot. location: 5, 35: Could not parse mass difference field. -> For input string: ""
location: 6, 35: Could not parse mass difference field. 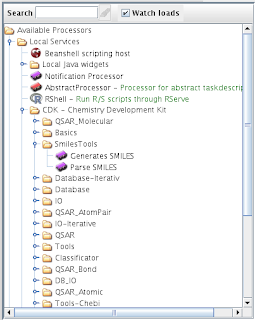 Note to myself, that atom block does not like like a MDL molfile atom block at all! Every second line outputs the Exception passed to the error handler. I have to say, those messages are rather cryptic, but resulting from a NumberFormatException, if not mistaken. location: 6, 32: Invalid element type. Must be an existing element, or one in: A, Q, L, LP, *. location: 7, 32: Invalid element type. Must be an existing element, or one in: A, Q, L, LP, *. Enough for now... dinner time. 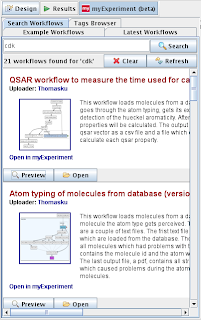 With support of SPARQL end points, and reading RDF from web resources directly (RDF/XML, N3, RDFa), Bioclipse is ready for the chemical semantic web. We now invite papers for our symposium on the use of the Resource Description Framework (RDF) technologies in semantic knowledge representation and data exchange in chemistry at the 240th National Meeting & Exposition of the American Chemical Society (ACS) in Boston this fall. Semantic Chemistry has been around for a while, but is seeing a revival with the adoption of the Resource Description Framework (RDF) and matching technologies in chemistry. RDF triples provide a simple structure that allow data and knowledge alike to be presented in a single framework. Derived technologies include the capturing of ontologies with the Web Ontology Language (OWL) and performing queries with SPARQL. A wide variety of free and open source product make it easy to set up servers with large amounts of RDF data, while integration with HTML is available too with RDFa. The RDF symposium at the 240th ACS national meeting in Boston invites submissions of talks about the use of RDF in chemistry and cheminformatics. Topics could include the use of OWL ontologies, OWL axioms, reasoning and interference, RDF in user interfaces, such as RDFa in web front ends, visualization, querying systems, and applications thereof, such as linking data sets, compound classification, cloud computing, web services, data aggregation, semantic publishing, and literature mining. Abstracts may be submitted via http://abstracts.acs.org. You’ll find the RDF session as part of the CINF division symposiums. Submissions open January 25, 2010, and the deadline is March 28, 2010. In case of questions, please email Egon Willighagen at egon.willighagen@farmbio.uu.se or Martin Braendle at braendle@chem.ethz.ch. Joe has released the first Chem4Word demo file, and has written about how to extract the CML with Java and with C#. I believe there is quite some room for improvement, but it's a start :) Thanx to Joe for posting the public domain test file, so that other projects can start play with the exiting new technology. I should note, however, that I am not running a Microsoft OS nor MS-Word, and the saved documents source are the only way I have access to the CML right now. 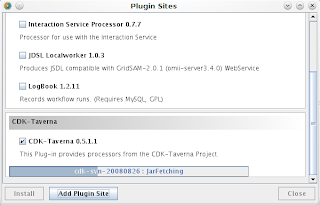 Thomas made a new release of CDK-Taverna for the Taverna 1.7.2 release, which is great news as the previous release was for Taverna 1.7.1. 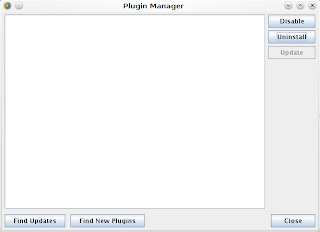 He asked me to test it, and I installed a fresh Taverna install and the new plugin. After that, I used the MyExperiment plugin to download one of the CDK-Taverna workflows Thomas has on MyExperiment, and tuned it a bit to use some local input instead of the database. 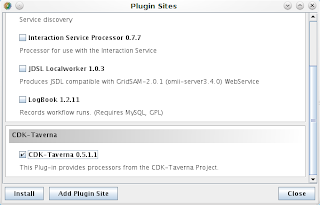 I took some screenshots while at it, and will use those now to talk you through the installation of Taverna and the CDK-Taverna plugin. This about everything to get you going. It's not particularly rocket science, but I guess this howto is useful as you get to see what you should expect when setting up a CDK-Taverna environment. If you have further questions, please leave those in the comments section, and I'll try to merge in answers where possible, or otherwise in the reactions too. I had not blogged about it before as the news hit me hard. Surely, Warren knew a lot of people and I only was only one of many, but Warren's memory sticked well. 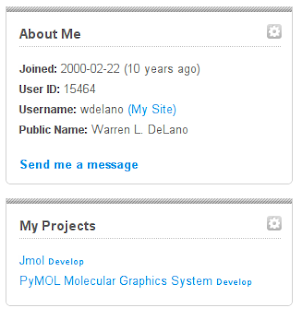 I know Warren from the Jmol project, where we talked in the past of coming to an Open Specification for exchanging scenes between Jmol and PyMol. Around the end of my PhD contract we even briefly, but seriously, explored doing a post-doc in his group. Anyway, lot's of people wrote up blogs (in arbitrary order: Rich, P212121, MacResearch, Jörg, MMB, Shirley, Derek, Wavefunction, Dan, Barry, and probably many more). They have set up a memorial fund which will focus on promoting the Open Source ideas of Warren, including an Award. Yesterday, I was pinged about Schrödinger acquiring PyMol. The press release is, as usual, short on details, but those have become clearer during the day. Schrödinger is not new to Open Source cheminformatics, and has an product based on KNIME, which is now GPL, but also has a proprietary license for those who wish to license so. Therefore, congratulations to Schrödinger for getting seriously into the Open Source community, making them the next Dr Who of PyMol, and congratulations to the family of Warren in ensuring continued development of the PyMol project! It's hearth-warming to see that despite the bad times they are going through, and all they options they had with the PyMol code base, they find time for and strength in supporting Warren's ideas about the future of cheminformatics. My thoughts are with them!